Following is a course map as well as a short description of each hole with hints on how you might best play them. Click the photo to view the course layout. The golf course starts out with a straight-away par five that plays longer than the yardage would indicate as it is all uphill. A deep bunker guards the right front of the two tiered green. This hole is a good birdie opportunity to get your round started. The second hole is at the highest point of the course with beautiful views of the mountains. Although it is not long, the dogleg left hole requires accuracy off the tee and on the approach to the long, narrow green. The third hole features an elevation drop of two hundred feet from tee to green and the views of the mountains beyond are extraordinary. A long iron or lofted wood is the smart play on this hole as the driver can easily go right out of bounds or left down into a gorge. The shot from the gorge is difficult and the walk down and back out is even harder. The second shot is usually a long iron across the gorge to a green protected by two bunkers. A par is well earned on this very difficult hole. The fourth hole is a short to medium length par three to a large green. Three bunkers guard the left side, but don’t go too far right or a grove of trees could swallow your ball. Hole number five is a long par five made even longer by the uphill climb. The back tees stretch the distance to 525 yards and the hole is rarely reached in two from there. A deep bunker guards the left side of the green and the slopes on the green are steep and slick if you go past the pin. The sixth hole is a dogleg left par four with out of bounds on the left. The smart play is to the right leaving a longer shot to the green but not risking the out of bounds. The green features a bunker on the left, but this is one of the few holes where you can roll your ball onto the green. The seventh hole is a short par three to a relatively flat green. It is a good opportunity to keep your round going with a short iron on a hole that does not have a lot of trouble. The eighth hole is short but is sharply uphill. If you do not get your tee shot elevated, it will catch the rough and die in the long grass, leaving a difficult uphill second shot to the green. A good drive will leave you with only a short pitch shot to a green that is quite steep with a false front, and is guarded by a bunker on the right front. Hole number nine is a short, downhill par four but it is more difficult than it appears. A long iron or lofted wood should get most players to within a hundred yards of the green and avoid the pond located straight ahead. It is a great temptation to pull out the driver and go for the green but the risk is high as the pond will catch any shot long or right and there is trouble with trees, mounds and a creek to the left. 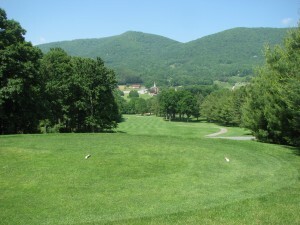 The back nine begins with a dogleg left par four with a creek that you have to cross twice before reaching the green. A long iron or lofted wood to a point short of the creek will leave you with a short to medium iron approach to the green. A more risky approach is to hit the driver and avoid the creek both left and right. A long and straight drive here will reward you with only a wedge to the green. Don’t go left on your second shot as the creek continues down the left side. This uphill hole is a straight away par five. The long, narrow green is about 40 yards in length, causing some very long putts. This downhill hole is one of the most beautiful on the course, but beware of the creek that runs the entire length of the hole on the left. The church steeple in the background makes a good target for the tee shot. 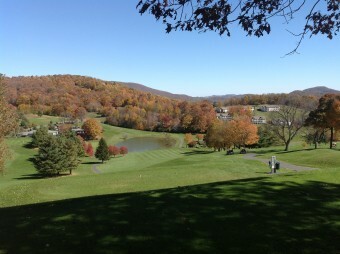 Try to avoid the trees on the right, and remember the hole slopes to the left toward the creek. The green is rather small and a par on this hole is well earned. This short par four hole has a creek that crosses the fairway about 30 yards in front of the green. A long shot over the creek can reach the green but the smarter play is a middle iron to the left of the fairway trap leaving a wedge to the green. This straight par three is more difficult than it appears as there is a creek all the way down the left side and a pond behind the green. The back tee stretches the hole to 204 yards and makes a par difficult. Number fifteen has a pond in front of the tee and a narrow landing area with trees on both sides. The hole continues uphill to a two tiered green which makes for difficult putting. 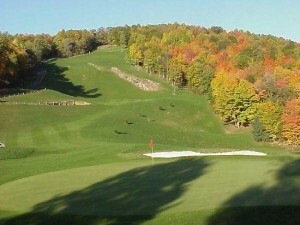 The last of this difficult three hole stretch is an uphill par three to a large green guarded by a bunker on the right. The long green curves to the right behind the bunker and the hole location will change your club selection and aim. The last of the par fives is quite short, but is uphill to a very small postage stamp green. This is the only remaining green from the original course built which was built in the late 1940s. This birdie hole can often result in a six or worse if you are not careful. 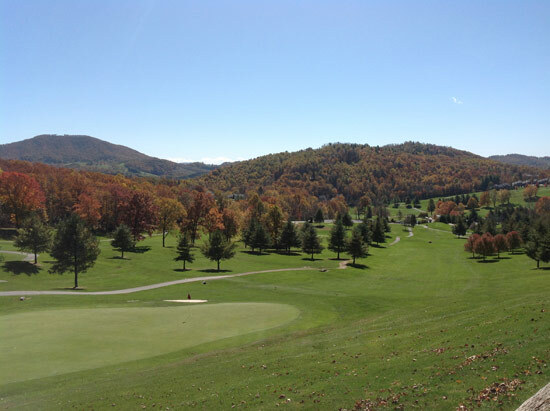 The finishing hole is a difficult par four which plays downhill off the tee and features beautiful views of the mountains in the distance. 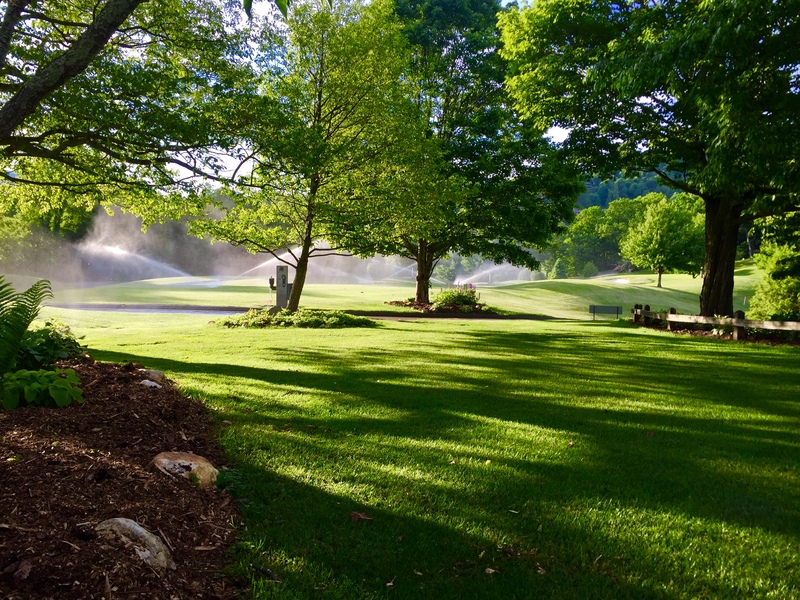 On your tee shot, watch for the pot bunkers on the left and the trees and rough on the right. The second shot is to a rather small green guarded by large maple trees on the left. A par on this hole does not come very often and will earn you bragging rights after the round. Come and give Mountain Aire a try! You will be rewarded by playing a well maintained and challenging course. 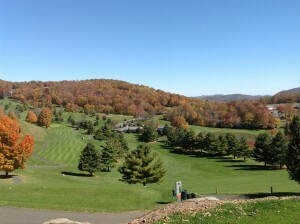 Mountain Aire is a true mountain course with magnificent views.